There are a broad range of tonal characteristics and a host of options to give you full control of your aural dreamscapes, including bi-directional octave shifting, tempo switching via tab button input and automatic arpeggio and tremolo effects. Waveform output can be manipulated via the shape control to influence the decay and sustain of each note, even up to “reversing” the sound of the input. The device is midi-compatible, both in terms of input and output, and can also be used with an expression pedal for applicable functions such as drive, tone, shape or tempo. The drive is traditional analog distortion, but can still be included and saved within the patterns and presets. Chords and notes can be sampled and fed into the sequencer via the hold switch, which creates an instant sustain either for an on-the-fly effect or as part of a saved effect pattern. On top of that, you can also record sequences of control changes for your own customized effect transitions. The Dream Sequence comes with a user manual and extensive online tutorials, and you are certainly well advised to work through these if you are going to get full advantage out of this extraordinary piece of kit. Check out the V&R video demo above for further details. And of course, feel free to share on social media. 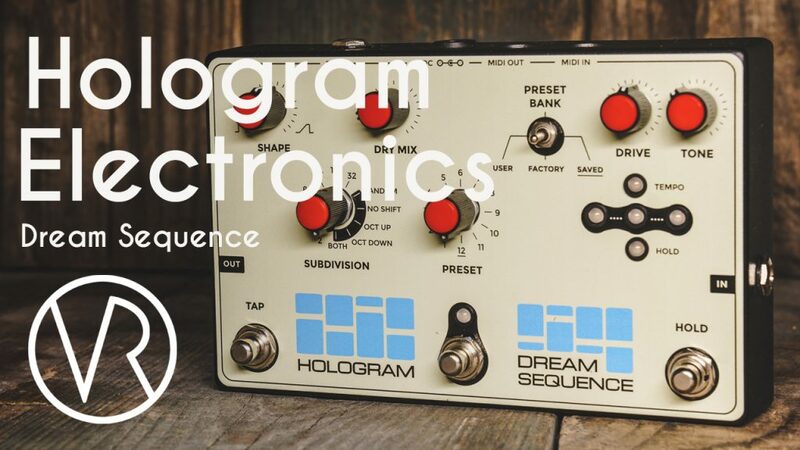 The Hologram Dream Sequence – ambitious, high-end, and highly recommended!